What makes yarn bombs so good is the surprising element they entail. 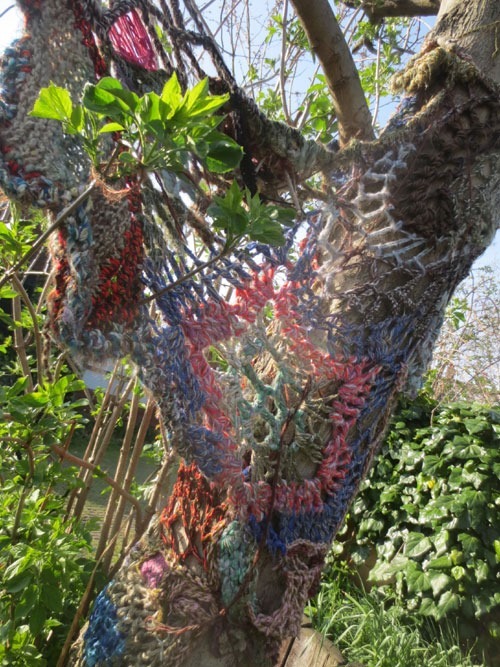 As well, yarn-bombs inject the cozy, homey and human nature of yarn into the environment. Be that place the wilder side of nature, such as a forest, the harsh industrial design setting of a city, or the practical outdoors setting of a city farm. It depends where the bomb has landed. Over the years, I have photographed yarn bombs in quite a few locations. Recently I made some images of some favorite yarn bombs in London. 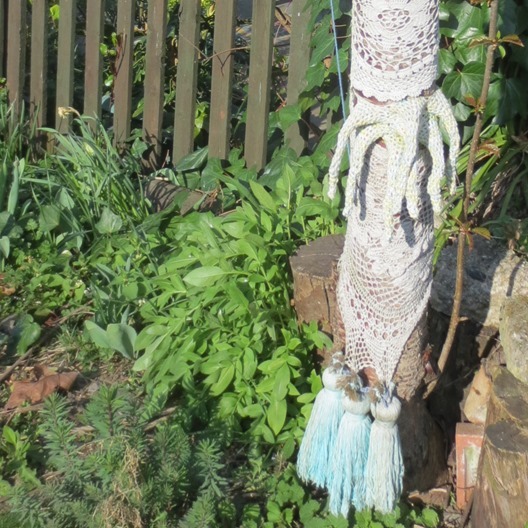 These yarn bombs mark the entrances to a restful side garden on this community farm. 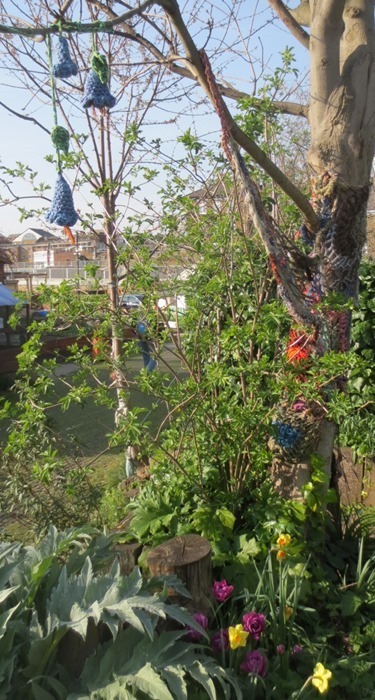 What is so successful about this yarn bomb in this community city farm is that it adds loads of subtle color to otherwise rather barren branches. When we think of yarn bombs, we usually think of ultra-bright, super-colorful yarn or crochet work wrapped around city objects. This yarn bomb is marked different because of its subtlety. The barren branches and tree trunks at this farm did received a color makeover, but a natural one. One that graced the garden and instantly made this part of the farm into ‘the happening place to be at peace’. Looking up to the yarn in the tree, the yarn bombs look natural, like bejeweled cobwebs. 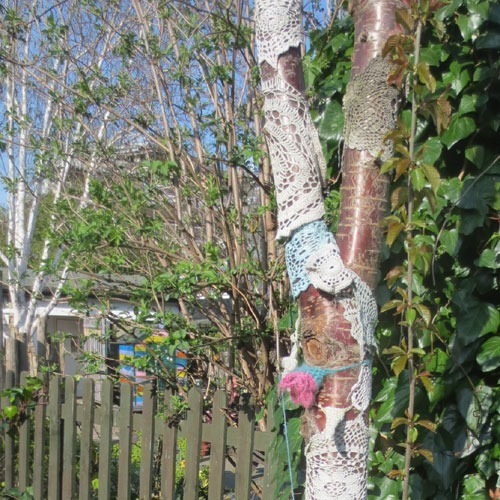 This yarn bomb also takes on shapes of nature. 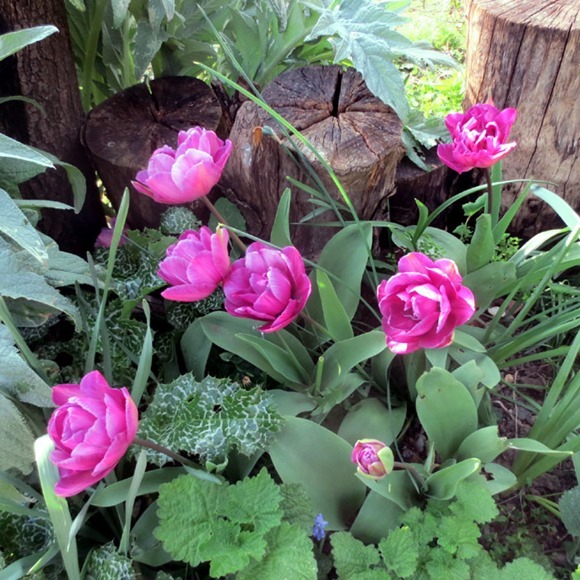 The bleu bells in the tree are nodding to the flowers now growing below, the pretty pink tulips. They almost look like roses. 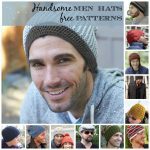 I guess someone is soon going to make a version of these in crochet…. My favorite tree was the one which received a hand-dyed blue and white yarn bomb. 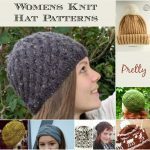 Yarn bombs such as these feel like an interplay of UFO’s, craft store finds of yarn remnants and sample flowers, and some site-tailored elements that mimic nature, to tie it all together. A true work of art. The tassels are an accolade. Over time, the worn yarn will only add to the authenticity and natural feel of these yarn bomb displays. What a clever idea. They look great hanging in the trees. Thanks for your comment, Bev. 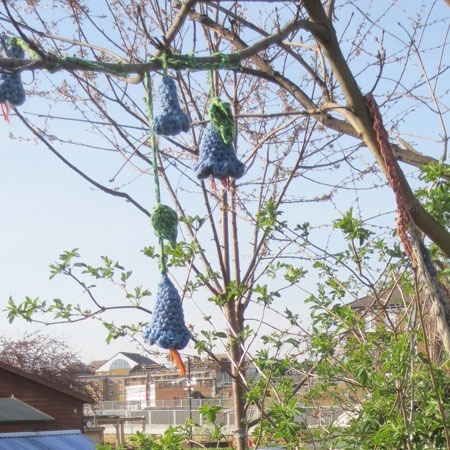 Finding these yarn bombs is such a cheery site, that I now want to keep all my UFO’s and giving them an alternative use if they don;t come to fruition by a certain date: hang them in the trees! Thanks for your comment, Bev. Yes, yarn bombs look so cheery for anyone to see. I think I’ll start saving failed projects and never-going-to-happen UFOs and hang them in the trees! So festive! !